The Association of State Dam Safety Officials (ASDSO) is a national non-profit organization serving state dam safety programs and the broader dam safety community with a mission to improve the condition and safety of dams in our country through education, support for state dam safety programs, and fostering a unified dam safety community. In September, Riverside’s Michael Crouch attended ASDSO’s Dam Safety Conference in New Orleans. It is one of the leading conferences in the United States dedicated to dam and levee safety and is well attended by engineers in the geotechnical, structural, and water resources disciplines. The water resources track at the conference accounts for about 25 percent of the roughly 900 attendees. This year’s conference offered sessions dedicated to hydrologic and hydraulic modeling with a focus on dam breach modeling, 2D and 3D flow modeling, and dam risk assessment. The conference provided a great outlet for Riverside to showcase our project work relating to dam safety, and Michael presented “Recognizing Uncertainty for a Dam Breach Analysis,” an analysis of our work on the Boone Dam for the Tennessee Valley Authority (TVA). The presentation focused on the adjustments made to the Boone Dam analysis that refined the loss-of-life results computed for various flood and warning scenarios. The final day of the conference included a field tour of the New Orleans Hurricane and Storm Damage Risk Reduction System. Highlights included a tour of the West Closure Complex and pump station while the pumps were being tested. The pump station is the largest in the world with a capacity of approximately 19,000 cubic feet per second. Other tour stops included the 17th Street Outfall Canal Interim Closure Structure and the Inner Harbor Navigation Canal Surge Barrier, which is the largest Civil Works project ever constructed by the Corps of Engineers. As part of Riverside’s mission of improving lives and livelihood, we regularly participate in outreach activities where we get a chance to interact with community members and businesses who are directly affected by the work we do. Recently, Riverside employees took part in a couple of outreach activities in the Southern United States as part of our work with the Southeast Fisheries Center. Since 1998, Ocean Commotion, a one-day educational event celebrating Louisiana’s coastal and marine resources, has brought together about 60 exhibitors, 2,000 registered students and 500 teachers and parents at Louisiana State University to interact with exhibits on the sea and our coastal resources. Designed for K-8 students and teachers, Ocean Commotion offers interactive exhibits that give students opportunities to learn about and touch the animals, plants, and minerals upon which Louisiana’s citizens depend. My Two Boots is a project designed to introduce students to Mississippi’s wetlands. Students learn what wetlands are and their values, how to identify the different types of wetlands, the animals and plants that inhabit them, and how the students can help protect them. Riverside employees are known for jetting around the globe spreading their knowledge of solutions to the world’s most challenging environmental issues. Next week is no exception. We’ll be chairing three presentations at two different conferences. First up is the American Water Resources Association (AWRA) Annual Conference in Denver. AWRA is a multidisciplinary association for information exchange, professional development, and education about water resources and related issues. There, John Park will present “A Framework for Improved Water Supply Forecasts in the Colorado River Basin” on Monday, November 16. Masih Akhbari will follow with two more presentations at the AWRA conference – “Enhancing Water-Energy-Food Security” and “Saving Agricultural Water in the Colorado River Basin” on Wednesday, November 18 and Thursday, November 19, respectively. Speaking at conferences and sharing our experience and passion about what we do is one of our favorite parts about working at Riverside. We hope you can join us at one of these events! In August, a group of Riverside employees was invited to participate in a US Army Corps of Engineers (USACE) workshop conducted at the district office in Vicksburg, Miss. The purpose of the workshop was to provide training on the latest version of the Corps Watershed Management System (CWMS) decision support framework which will be implemented nationwide at USACE offices as part of the Modeling, Mapping, and Consequences (MMC) program. Riverside is one of three contractors working with the Corps on the model development, system deployment, and customization of the Control and Visualization Interface (CAVI). Model development will include creating the supporting operational hydrologic and hydraulic models that will allow the Corps to make informed reservoir release decisions. The workshop presentations were made by several USACE staff from the Hydrologic Engineering Center (HEC) on the latest features and changes to their hydrologic and hydraulic modeling software platforms. The HEC, which was established in 1964, is the Corps’ technical leader in research and training and is responsible for development and maintenance of the USACE suite of models, including CWMS. 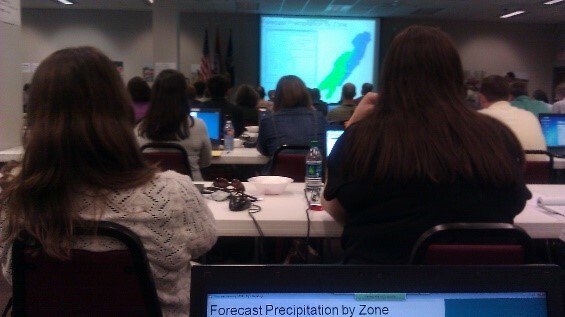 Of particular interest were the presentations on the recent advancements in 2D modeling capabilities and flood inundation mapping features recently added to the HEC’s River Analysis System (RAS) model, as well as new snow modeling features that have been added to the Hydrologic Modeling System (HMS) model. Michael Crouch, who has extensive experience developing dam breach and hydraulic models from prior work with the MMC program and who will serve as Riverside’s consequences technical lead and as a senior modeler. Noah Friesen, who has led a number of reservoir model development tasks for Riverside’s previous CWMS work and who will serve as a deployment manager and senior ResSim modeler. Ian Maycumber, who has developed hydraulic models for previous CWMS implementations and will serve as Riverside’s data management and information systems technical lead. While in Vicksburg, we enjoyed the local culture and cuisine. We learned about the history of the Corps work on the Mississippi River and Tributaries (MR&T) project at the Lower Mississippi River Museum. While at the museum, we were able to explore an outdoor scale model of the river as well as build and test our very own levee system in the sandbox play area. We also toured the RSS Mississippi IV, which was used to inspect projects along the river and conduct associated Corps business. Also in Vicksburg, we visited the historic Civil War battlefield and National Military Park, a reverent and majestic area with numerous monuments and moments for solemn reflection. 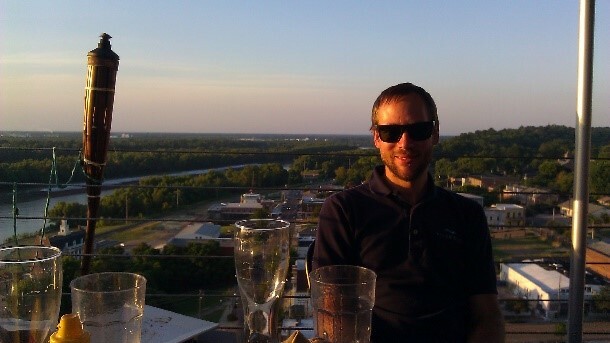 In addition to the rich history of the Vicksburg region, we enjoyed the fine southern cooking at roadside diners such as the Bovina Cafe and more modern fare at the rooftop restaurant 10 South. Whether it was the chicken and dumplings or fried catfish, we were well fed the whole trip. Riverside is excited about this opportunity to support the Corps through the MMC program and help achieve the USACE goal of nationwide implementation of CWMS to support critical operational decisions for years to come. We are confident these decisions will continue to protect life and property across the country during future flood events and times when informed water management decisions will be critical. Inspire, Innovate, Invest — the Riverside way! Riverside’s culture has always focused on providing excellent service for our clients as well as being an inspiring and fun place to work. Our mission includes the importance of innovative thinking in solving challenging water and climate-related problems. 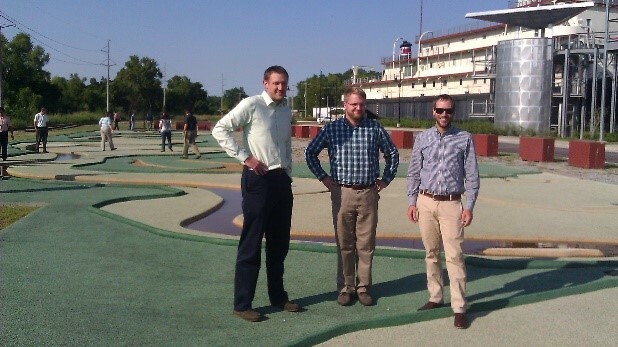 We recently took our internal goals a step further with our first annual I3 contest. I3, which stands for Inspire, Innovate, and Invest, is an initiative designed to provide our employees with a mechanism to promote their ideas – ideas we know can drive change for our company and our customers. Eight teams signed up to present eleven inspiring ideas at a brown bag event, and anything was fair game – from a simple process improvement to a complex gadget. Teams had five minutes to pitch why their idea should move on to Stage 2. Pitches ranged from a developing a mobile note-taking app specifically for Riverside meetings and developing a complex set of decision support tools to turning a spare office into a “family room” and a product that alerts building inhabitants that severe weather is imminent. The top three ideas were selected by the Riverside staff, and then those teams had 24 hours (with expenses covered by Riverside) to develop their pitches into 20-minute presentations given over a pizza party the next day. From there, our esteemed I3 committee selected the winner based on criteria concerning the innovation and beneficial impacts of the idea – and the winner was the Irrigation Management and Scheduling Assistant (IMSA). 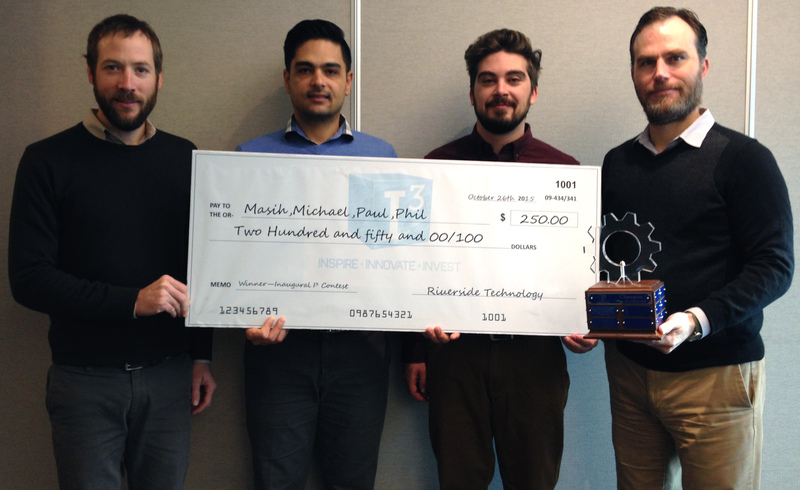 The team was presented with a customary large (but useless) check, $250 cash, a rockin’ trophy, and a commitment from Riverside to invest resources to help foster the team’s idea and continue promoting this culture of innovation. We’re excited about the bold visions our collective Riverside team has for the future of the company and the world! Solving the world’s most challenging climate-related problems is serious business, and even the brightest scientists and engineers need to lighten the mood every now and then. 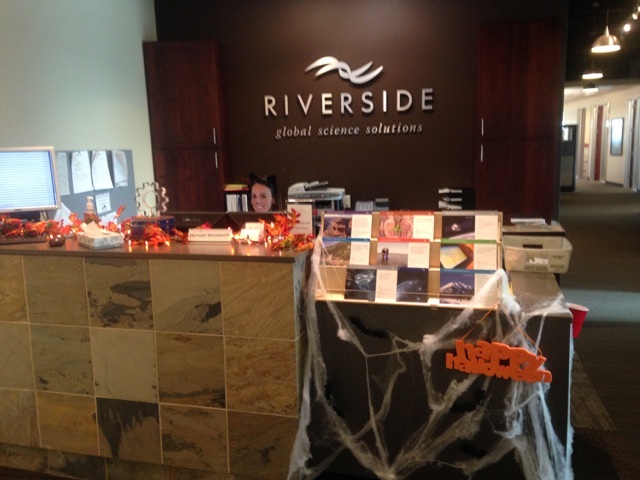 Riverside employees did just that last week for our Halloween celebration that included a work space decorating contest as well as a costume contest. As the week went on, more and more spider webs, bats, and all things orange and black began appearing throughout the office headquarters in Fort Collins, CO, and by Thursday, the spooky holiday was in full effect. Our celebration culminated Thursday afternoon with the awards and plenty of Halloween treats. Employees competing for Best Costume ran the gamut from a bottle of Sriracha sauce to Mr. Clean, a ninja, an 80s girl, a Viking, a gypsy, and a mix of sorcerers and witches, among many others. The winner was Noah Friesen in the timely character of Doc from “Back to the Future.” The work space award went to Katharine Anderson, whose creepy spider theme made even entering her work space a challenge. We hope you all had as much fun on Halloween as we did! 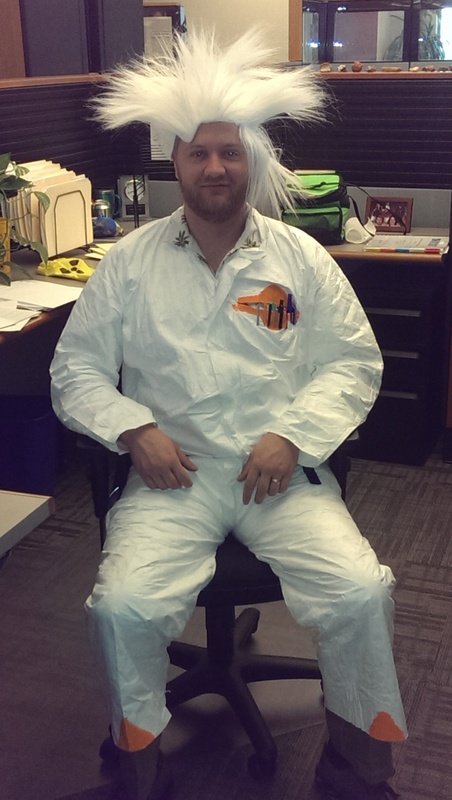 Water Resources Engineer Katharine Anderson went all out to claim the prize for Best Work Space Decorations. 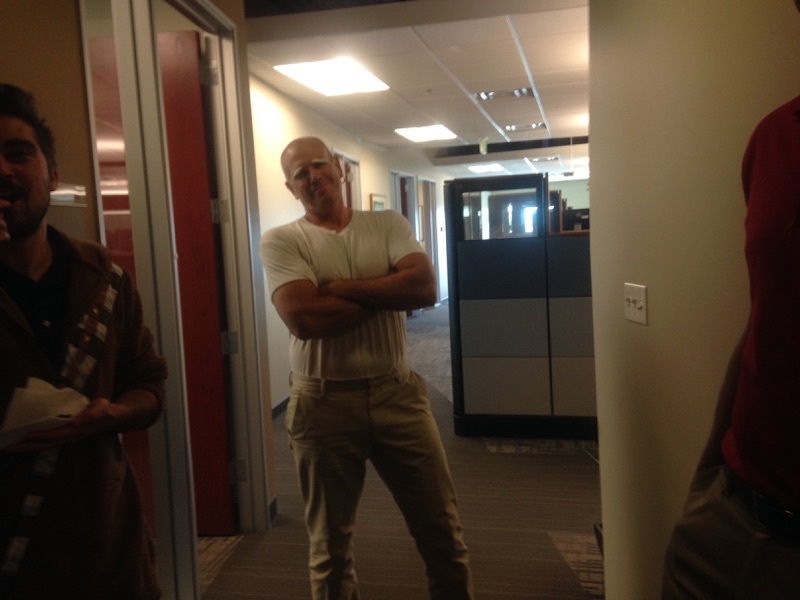 Michael Kane, Director of Operations, channeled his inner Mr. Clean. 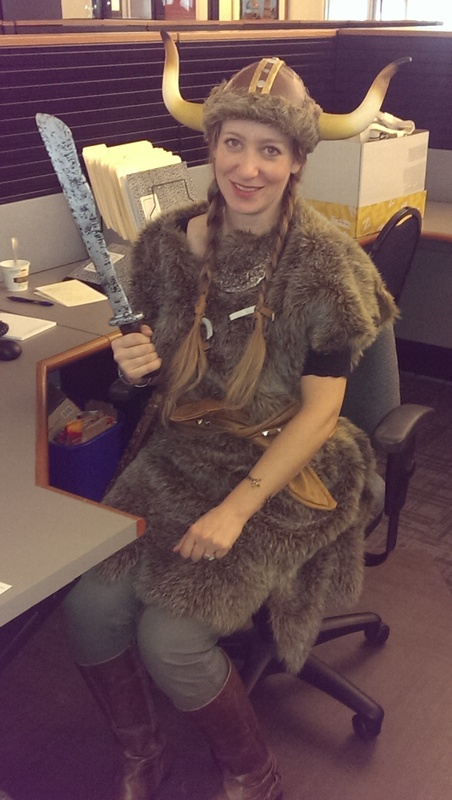 Project Coordinator Katie Ordal came ready to slay any beasts that happened to be wandering the office. 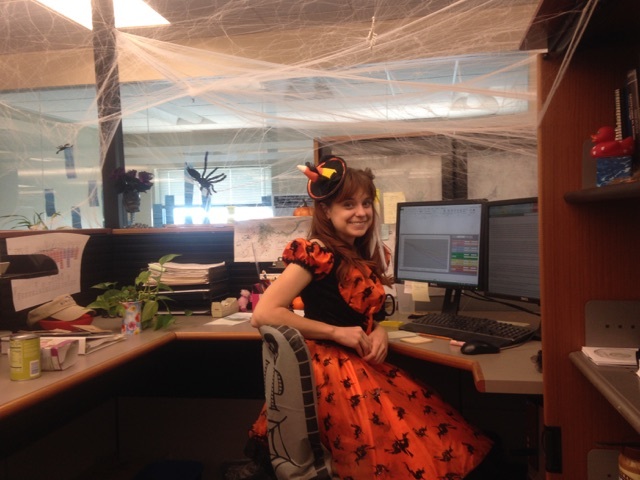 Michelle Woodworth, Administrative Support Coordinator extraordinaire, nailed the Halloween spirit. 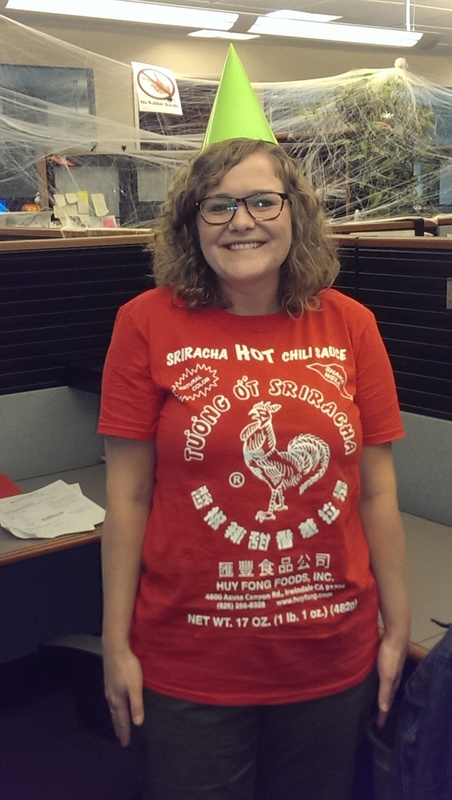 Water Resource Engineer Abigail Watson added some spice to the day.